These fritters resemble onion bhajis and therefore will go particularly well with a homemade tikka masala (see my recipe from January 2017), or indeed many other curries! I opt for a more neutral flavoured oil if I’m serving the fritters alongside a curry. I find these fritters to be incredibly versatile and think they make an excellent lunch served with a yoghurt dip. Alternatively, they are delicious with fig chutney. A discovery I made last year after a very kind neighbour left me a bucket of homegrown figs on my doorstep. Had I known how well the fig chutney works with these fritters I wouldn’t have given away as many jars! If you would like to try this fantastic combination the fig chutney recipe will be posted later this year, in September. However you choose to serve these little beauties, I recommend you do so straight out of the pan when they are, without doubt, at their best. You can add some seasonality to this recipe using a selection of vegetables; try grated carrot or courgette. Whisk together the culture, flour, 40g water, spices, seeds, salt and pepper. The batter needs to be the consistency of double cream, so add a little more water If necessary. Stir in the onion and potato. Fill a suitable pan with 2-3cm of oil and bring up to about 190C. When the temperature is close, drop a small amount of the batter into the oil- and if it fizzes enthusiastically the oil is about ready. Gently dollop spoonfuls of the batter into the oil. Don’t overcrowd the pan and cook the fritters for about 3-4 minutes on each side until they turn a deep golden brown and develop a crunchy outside. Repeat until all of the batter is cooked. 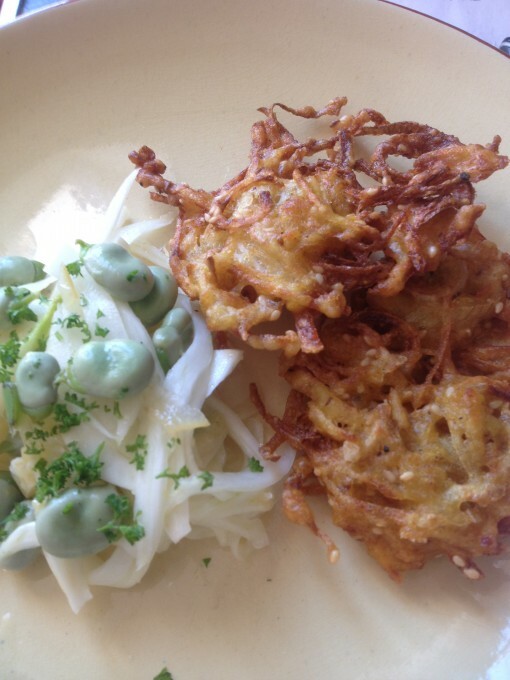 Tomorrow’s recipe for a Fennel, Broad Bean and Preserved Lemon Salad works really nicely as an accompaniment.